Note: On this tour, you will go to exotic Jiuzhaigou, enjoy Huanglong colored pool, wohip Giant Buddha, and get closer to Giant Panda. 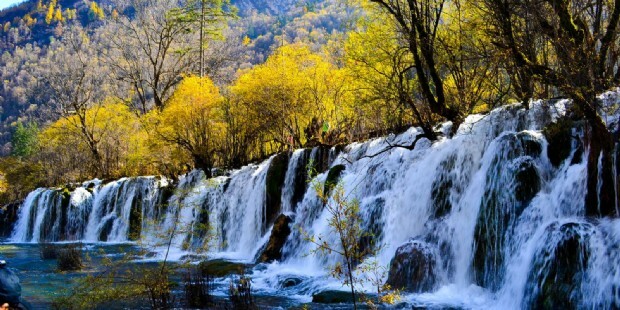 On this tour, you will go to exotic Jiuzhaigou, enjoy Huanglong colored pool, worship Giant Buddha, and get closer to Giant Panda. Private transfers and guide service. 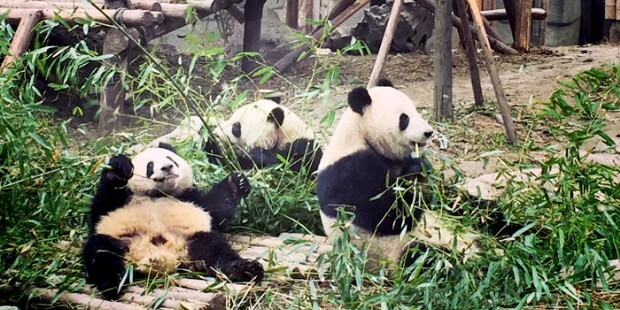 The guide will meet you at airport, then proceed to Chengdu Research Base of Giant Panda Breeding, which is a non-profit research and breeding facility for giant pandas and other rare animals. After that, transfer to hotel for check-in. After hotel breakfast, transfer to Jiuzhaigou. 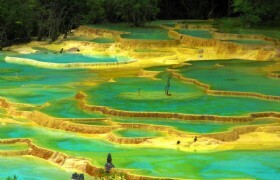 You will visit Songpan Ancient Town and Diexi Lake along the way. Overnight in Jiuzhaigou. Songpan ancient Town: Songpan Ancient Town, known as Songzhou Town in ancient times, is located in northeast of Aba Tibetan and Qiang Autonomous Prefecture, Sichuan Province. It was built in Tang Dynasty and has a long history of being regarded as the "West Portal of Sichuan" as an important military base and trading center for horse and tea exchange because of its unique geographical location. Nowadays, Songpan has gained its reputation and attracted a lot of tourists every year as one of the most interesting historical towns in Sichuan Province. After breakfast, you will take sightseeing bus to visit Jiuzhiagou full day. 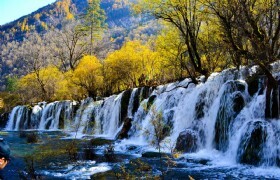 Shuzhen Vally—Bomsai shoals, Shuzheng lakes, Sparking lake, Lying dragon lake, Shu zheng falls, Tiger lake, Rhinoceros lake, Nuorilang waterfall. Rize Vally—Mirror Lake, Five Flower Lake, Pearl Shoals Waterfall, Pearl shoals, Peacock riverbed, Panda lake, Arrow bamboo lake, Awan lake,grass lake, Zehchawa Vally—Long lake, five coloured pond. After dinner, you can enjoy the Tibetan Show at your own expenses. This morning, you will go to tea sho, then proceed to visit Huanglong Scenic Area(Exclude Cable car,for up RMB80/PAX, for down RMB40/PAX) . You will visit Guest-greating pond, Billowing lake, Feipu waterfall, body washing grotto, Golden sand on earth, lotus stand waterfall, Bondzai pond, mirro pond, rhododendion pond, beauty-competing pond, diagon ridge waterfalljade-green pond, moon-retlecting pond, Multi-coloures pond, Ancient huanglong temple. After that, transfer to Maoxian. 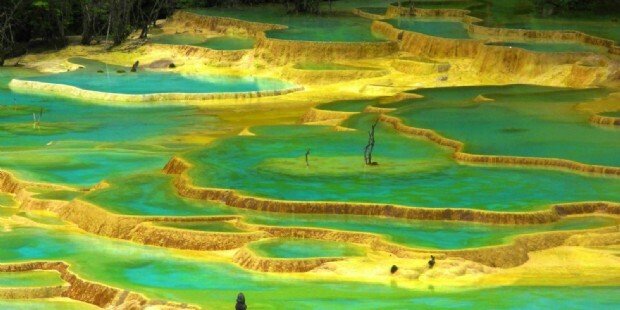 Huanglong Scenic Area: Huanglong is a scenic and historic interest area in Songpan County in the northwest part of Sichuan, China. 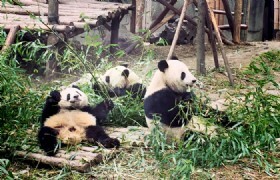 It is located in the southern part of the Minshan mountain range, 150 km north-northwest of Chengdu. After breakfast, you will visit Baishi Qiang Village, then proceed traditional Chinese Medicine shop. 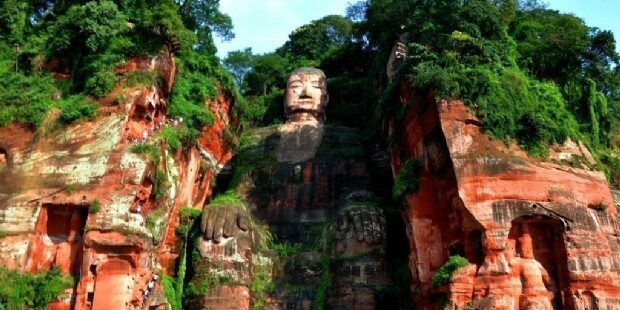 After lunch, transfer to Leshan and Visit Leshan Giant Buddha by cruise. Overnight in Jiajiang or Emeishan. 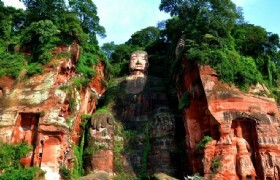 Leshan Giant Buddha: The Leshan Giant Buddha is the tallest stone Buddha statue in the world, carved out of a cliff face by an 8th-century monk in southern Sichuan province. Built during the Tang Dynasty (618–907AD), this Giant Buddha of Leshan overlooks the confluence of the Minjiang River, Dadu River and Qingyi River and faces the sacred Mount Emei (with which it shares its World Heritage status), with the rivers flowing below his feet. This morning, you will go to Bamboo charcoal shop. Then transfer to Emeishan. You will take sightseeing bus and Jinding cable car to the top of Emeishan(Golden Summit). 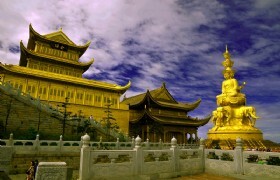 You can see many Buddist Temple and pray happiness there. About one hours later, taking cable car to the foot of Emeishan. 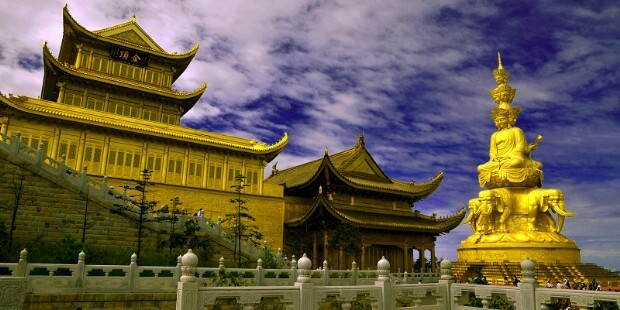 Then return to Chengdu, you will visit Huanglongxi ancient town. You can see many old buidlings, taste local snacks, and enjoy relaxed life. After dinner, you can enjoy Sichuan face changing show by yourself. This morning, you will go to silk museum. Then transfer to airport. 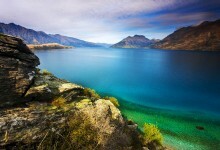 * Prices may vary according to your travel time and are higher in the high season, e.g. China National Day Holiday (Sep 29-Oct 8, 2015), and Western China International fair(Oct.01-07). *Shopping stop: Medicianal shop, silk, tea, and bamboo-charcoal shop. * Optional activities: Sichuan face changing show RMB200/per person; Tibetan dancing show RMB200/per person.